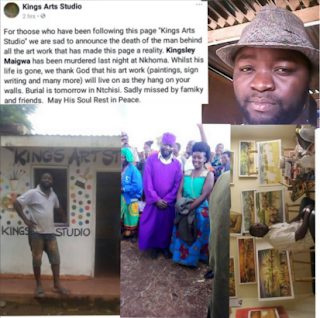 A Malawian artist Kingsley Maigwa, was reportedly beaten to death by villagers in Nkhoma after he allegedly killed his houseboy by accident. Eyewitnesses claimed that Maigwa grabbed his houseboy by the scrotum and squeezed it so hard after he gave him an unreliable reply after he questioned him about the missing money. The squeeze made the scrotum burst, as the houseboy collapsed in pain. He was pronounced dead at the hospital. Maigwa who was arrested for murder was however dragged out of the Police Station by angry villagers who beat him to death after they heard what transpired between him and his houseboy.